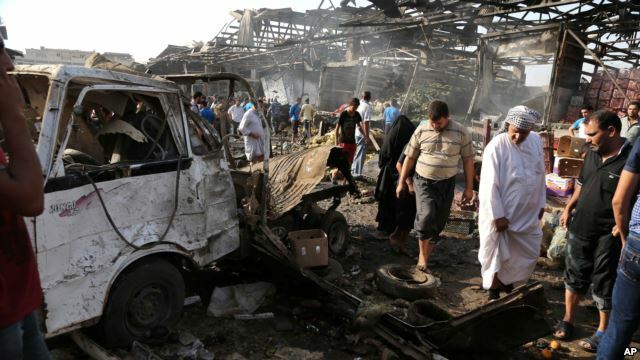 Civilians inspect the scene of bomb attack in Jameela market in the Iraqi capital's crowded Sadr City neighborhood Baghdad, Iraq, Thursday, Aug. 13, 2015. 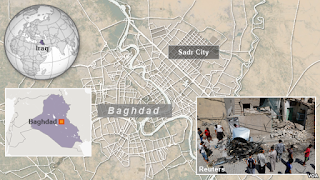 Iraqi officials said a powerful truck bomb tore through a Shi'ite neighborhood in Baghdad Thursday, killing at least 62 people in one of the capital's largest bomb attacks in months. Dozens more were wounded when a refrigerated truck packed with explosives was detonated just after dawn at the crowded Jameela market in Sadr City, according to the officials. The explosion left a scene of devastation, with body parts, fruits and vegetables, and pieces of wooden stalls strewn across the market, which is one of the largest in Baghdad. Ambulances and firetrucks rushed victims from the scene, while residents frantically rushed others to local hospitals in their private vehicles. It is the latest attack by the Islamic State group on areas dominated by Shi'ites, whom it considers to be heretics. The Sunni extremist group seized large amounts of territory in Iraq in 2014, capitalizing on widespread Sunni frustration at the country's Shi'ite-dominated government. The government, along with Shi'ite militia groups, is fighting Islamic State militants in several provinces. A U.S.-led campaign of airstrikes is also targeting the extremists. Outgoing U.S. Army Chief of Staff General Ray Odierno on Wednesday said the yearlong bombing campaign has made a small amount of progress, but that the conflict had essentially reached a stalemate. Odierno said Washington should consider embedding U.S. troops with Iraqi forces if the Baghdad government does not make progress against the Islamic State group in the next few months. "We should probably absolutely consider embedding some soldiers with them and see if that would make a difference," Odierno said at his last Pentagon press conference. "I think that's an option we should present to the president when the time is right." But the general warned against relying too much on American military force to defeat the militants, saying they cannot solve the country's current economic and political problems. "We could probably go in there with a certain amount of American force and ... defeat ISIL. The problem is, we would be right back where we are today six months later," he said, referring to an acronym for the extremist group. When asked if he sees any future reconciliation between Iraq's Shi'ite and Sunni populations, Odierno was pessimistic, saying partitioning the country is "something that could happen." "It might be the only solution, but I'm not ready to say that yet," he said.